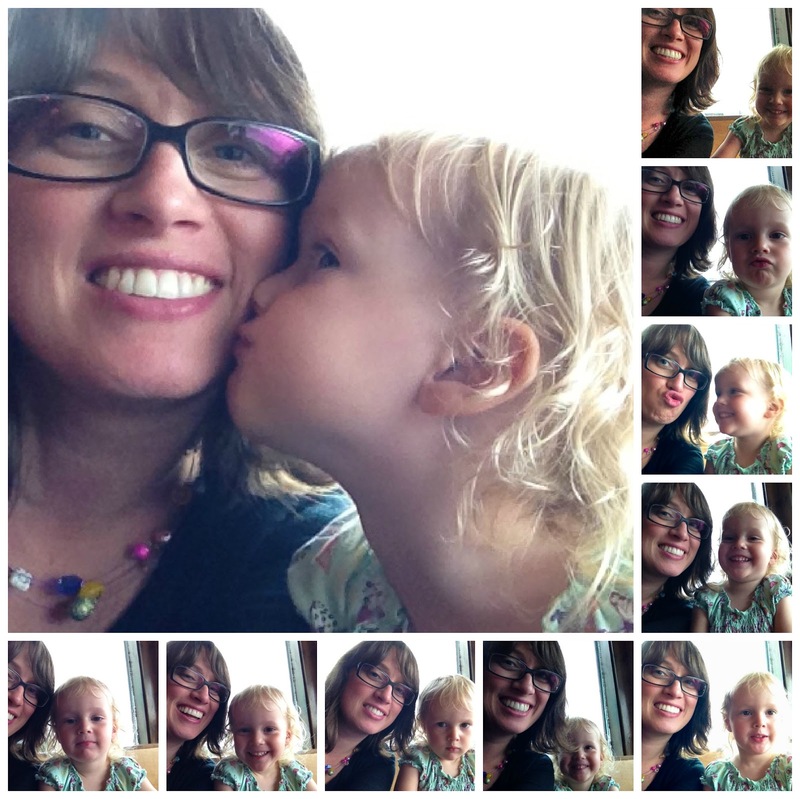 We've been watching this Butterfly Colors Song video on YouTube over and over and over again. My girls (aged 6 and 3) love it. My 1st grade beginner EAL students love it. And it's a fun resource for teaching colours. We made easy butterfly puppets to go with the video so we could perform along with it on the screen. 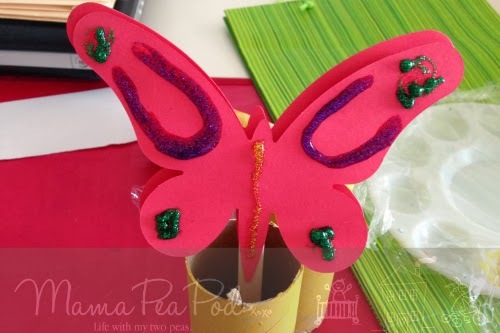 Simply cut out a butterfly shape (I used the die-cutter [affiliate link] at school since I was making them for a whole class, but you could easily draw your own template or print one from here). 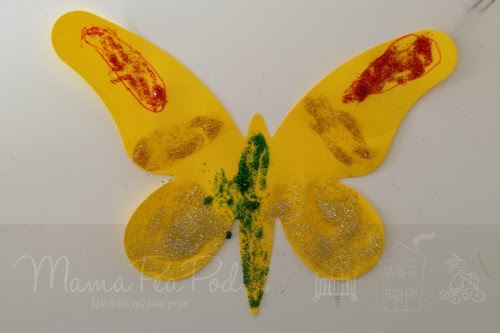 We made one per child per colour, so six butterflies each. 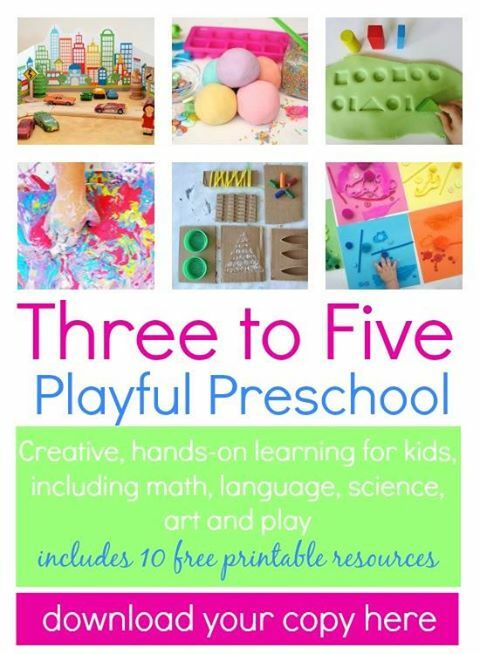 At school we made them single-sided with a craft stick [affiliate link] on the back, but the ones we made at home were double-sided, with the craft stick glued in between. 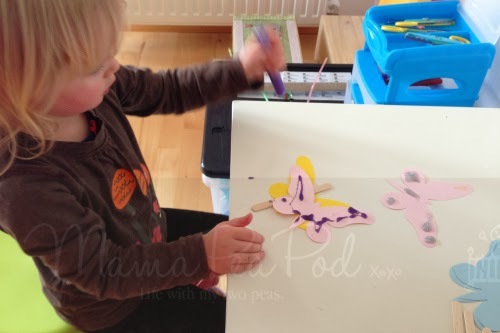 Then have your child colour the butterflies to match the colours in the video. You can also have them add further decoration with sequins, glitter glue, tissue paper, feathers, [affiliate links] etc. in the same colour. Then play the video and have your butterflies dance along as you sing the song together! 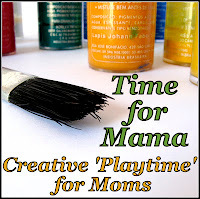 We tried snow painting last spring, and it was such a quick and simple activity to prepare, but the kids had so much fun playing! They've been talking about it ever since (we did it last spring! ), and can't wait for snow this year so they can do it again! 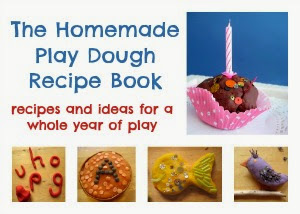 Just fill some squirty bottles [affiliate link] with water, add a few drops of food colouring, and they're all set! 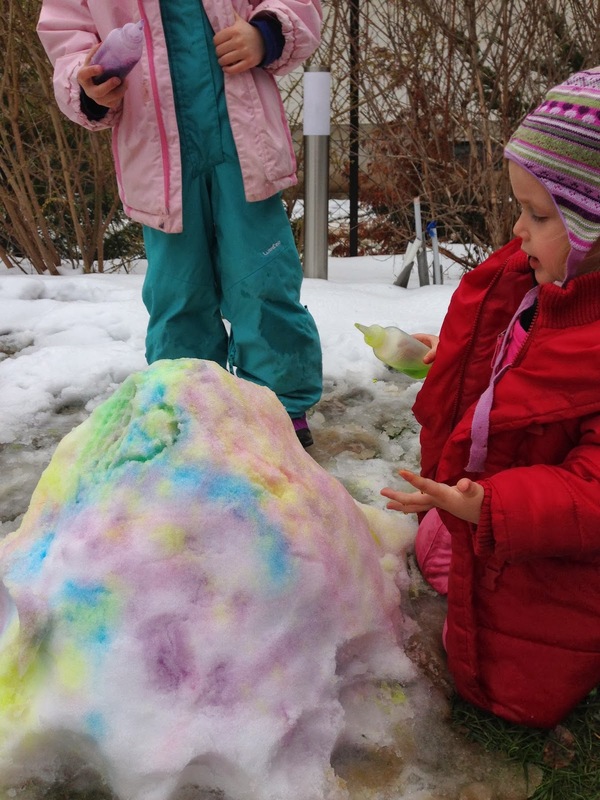 They wrote their names in the snow, made a giant snowcone, and gave the snowman a makeover! Pizzazz for Your Party Table! "Mummy, I can't take my eyes off them, they're just so loveable!" If you're looking for a little pizzazz to dress up your party table, these edible 'sparklers' were so easy to make - they literally took 5 minutes - and are an easy party treat for kids to make! We made them for New Year's Eve, but they would be perfect for any fireworks night such as the Fourth of July or Canada Day, or for kids' birthday parties. To make them, get some pretzel sticks or bread sticks (we liked the salty pretzel sticks combined with the sweet topping - mmmm!) and dip the top half in melted chocolate (see my tips for melting chocolate here, as it can easily burn). Then we quickly rolled them in various sprinkles. (Do not use coloured sugar as it will just dissolve in the warm chocolate.) I had a few gold sprinkles left, which I combined with some confetti sprinkles, some star sprinkles, [affiliate links] and some normal rainbow sprinkles, mixed together on a shallow plate. I love how the combination turned out! Then lay them out on some baking paper or wax paper, spaced apart, and refrigerate for a little while until the chocolate hardens. They really remind me of real fireworks! 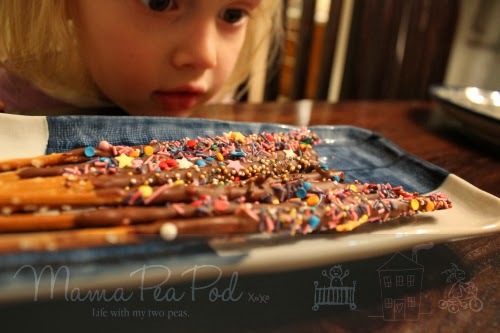 I first saw the idea of edible sparklers over at Nurturestore, but hers are a bit different - made from chocolate fingers. Have a look and see which will work for you. These are definitely going to be our new party food staple! Don't miss out on new ideas! Affiliate links are links to websites where items are for sale, and for which I receive a percentage of the sales made from traffic that comes through my pages. These profits help to pay for the expenses associated with keeping this site going. Thank you for your support. 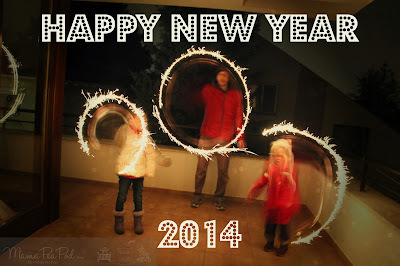 Happy New Year, everybody! I wish you all a wonderful year in 2014! I'm still on break, but will see you soon! If you don't want to miss my next post, you can subscribe here.